Quackdown! - Welcome to Quackdown! Published: Feb. 5, 2011, 12:50 a.m., Last updated: Feb. 21, 2011, 11:48 a.m.
A multitude of companies and people offer untested treatments and cures for nearly every human ailment. It is extremely difficult for patients to tell what is genuine and what is nonsense. This website exposes fake medicines. We hope that it will help people make informed choices about their health-care. Besides analyses of medical claims, we also host the QuackBase, a database of untested and false medical claims. 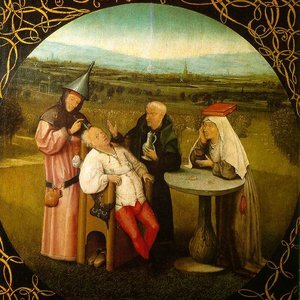 The painting is called The Extraction of the Stone of Madness or The Cure of Folly. It was painted by Hieronymus Bosch. Read about it on Wikipedia. We chose it for our first article because of its association with medical pseudo-science. Some of the history behind this painting is described in this excellent article by Laurinda Dixon. Also see this excellent page on scienceblogs.com. I'm very happy to see that a site like this has started up in South Africa. For a long time I have thought that we desperately need more activism against quackery and pseudoscience. Fantastic, good luck with your efforts, I hope that I may contribute in the future. Thanks Anthony. Please do feel free to contribute (use the Contact form). If it's good, relevant and won't result in us losing our underwear in litigation, we'll publish it.